Hello writer creature of the darkness…can you believe it’s MAY ALREADY?!??? Now is a stunningly good time to panic and realise the year is nearly half over and we must write ALL THE WORDS. Or cry over all the words!! Either way!!! WORDS. 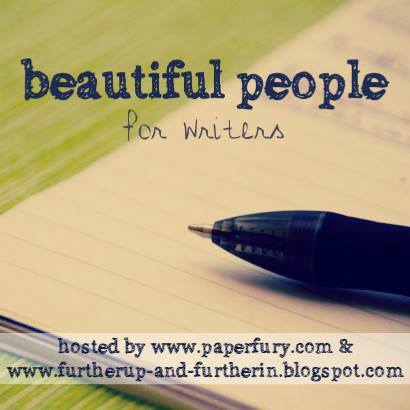 Also apologies for the unexpected Beautiful People hiatus last month. But we’re baaaaack. This time with a parent-themed edition in honour of Mother’s Day. Although, if your character doesn’t have parents, feel free to use the questions for a parental-like figure, caretaker, or guardian. OR! You can also snoop our archives and use one of the old sets of questions. Go wild, fiends. OH! And the linkup is open all month. And check out our FAQ page for more details and to see the archives. so what have you been working on in the writerly realms, lately, fiends? did anyone do Camp NaNoWriMo and how did you go??? have you had any exciting plot bunnies lately?! and how often do you write parents into your books??? LET US CHAT. I’ve decided to do this twitter WIP challenge all may, and so far it has convinced me to work on a little of my story every day, though I’m not sure that I’m ready to tell it. (so many characters are currently called ______. Anyway, hopefully I can give Lighter Places some love this month. Apart from that, I’ve been idly writing a play, but I need to figure it out a lot more, and also doing some poetry and short stories. But I’m defintiely going to do Beautiful People this month. I’ve been trying to avoid plot bunnies, but I may end up chasing some of them in Lighter Places (involving driving a scooter in traffic and younger siblings, among other things) I usually have parents involved in some way, because whether we like it or not, parents matter. OF COURSE! The questions are for anyone to use, anytime!! GO WILD, MY FRIEND. And also *passes you coffee cake for delicious caffeinated motivation* Honestly last year was a sluggish one for me, but I’ve been rather motived this year. Up until this last month haha.😂 But good luck with this current WIP of yours!! That’s cool! The questions are always open for interpretation! Oooh! As someone who puts a lot of emphasis on families in her stories, I quite like this theme! Now, I just have to decide who to do it for . . .
Camp NaNo was a complete bust. Mainly because I forgot that final essays are released around that time, so I didn’t have all the time to write that I thought I would. We will never speak of it again. I’M SORRY FOR YOU ABOUT NANO. But hey! There’s always other times! And eeep, I hope the essays went well though. I think I’ve only ever written one story where the character didn’t have any parents. It was my first full-length novel, and of course the MC was a special-snowflake orphan raised by her grandfather. LOL… Tropey. Haha, I don’t do these but I feel like I should do this one for some reason. I’m probably finally going insane… Alas. Ugh, campnano. It killed me and I failed it. Lose-lose situation. I usually have my characters have parents, though I have a really bad tendency to make them distant, but I’m getting better at that. Oh that will be super interesting to see them contrasted!! LOVE IT. And I totally understand. 😂 I actually generally don’t write good parents into my books, but I’m trying to fix that!! Good parents are excellent in books! My current WIP is currently filled with orphans… But there are guardian-type beans, so I SHALL CONQUER, MWAHAHAHAHA! I had every intention of doing Camp NaNo and… it just didn’t happen, haha. Oh well. As of now, my writing projects just suddenly popped out of me because I really have been wanting to write fluff stories (because who doesn’t like those) so I spent a few hours yesterday outlining two stories of fluff and it has me all kinds of excited! One between two nerdy best friends who cosplay together and have been in love with each other for years, but neither has admitted it; and then the other between two boys in their school’s choir, one who’s in a band and not out except with his mom and bandmates, and the other who also isn’t out at all. But omg what I wrote has me so giddy excited to write these stories! I actually am going to incorporate their parents into each story, and they’re going to be great parents. I mean, of course there’s always going to be problems because teens don’t always get along with parents, but still. There’s always Camp in July!😂 Or just writing…anytime right?! Such a good list of questions! — and so relevant to the characters in the story I am (now desperately) trying to tell. That is a screenplay, F.Y.I. about four fellas, all who meet in a well-known an disparaged U.S. war effort (guess which one) and who all have parental “issues” as they say. Makes me think-but have already pretty much clarified relationships with their past, particularly as relates to parents, one parent surrogate (a grandmother), etc. Now to get this into the dialogue…! Their character sketches are already pretty long-scenes all over the place, and don’t want to be a (poor cousin to) Fitzgerald who wrote and wrote, but never actually produced a decent screenplay…any suggestions y’all?! ?